As a lawyer, I’ve filed countless briefs and appeared on behalf of clients before courts in many states across the country. As you might guess, briefs and court arguments are fact and law based and there is no room for fiction. So writing Deviant Agendas, my first novel in The V-Files series, has been exciting and a labor of love. For me, writing has always been a joy, and playing with words to create powerful points that people can consider and respond to is one of the most satisfying aspects of writing. But writing a novel lets me do more than make a point. It allows me to create a world where my characters come alive and can say and do what they want. When I began writing Deviant Agendas, I really didn't plan the genre or characters. Rather, I sat down one morning after a run, and started writing. I let whomever showed up on paper come alive. They told me who they were and where they were headed. I was just the conduit. Since I've lived in the legal world for more than 30 years, and have a great respect for the law, it's not a surprise that my characters took me to the world of law. It's wide ranging and fascinating and touches almost everything in our lives. It's also not a surprise that the female protagonists are strong, smart and independent. You’ll learn more about them when you read Deviant Agendas. Deviant Agendas: A Victoria Rodessa Legal Thriller by Katherine Smith Dedrick is Volume 1 of the V-Files. Victoria Rodessa has graduated from law school and has gone to join Acker, Smith & McGowen, one of the top international law firms that pushes female lawyers to succeed. The partners have high ambitions and when a top case falls into Victoria’s lap, a case that is important to their ambitions, she starts the journey to become the first female partner of the firm. Things are not what they seem at first glance though, and Victoria could be heading for trouble. She has to make a big decision – listen to her conscience and risk losing all she has worked for, or stay quiet and pay a far higher price. Which path would you take? Deviant Agendas by Katherine Smith Dedrick is a cracking legal thriller. This is real edge of your seat stuff, a gripping rollercoaster ride of a story. Victoria is the kind of character you can instantly feel an affinity with, a smart woman who is good at what she does. The development of the characters throughout the book was excellent and I really felt as though I were a part of their world. This book has a great plot, intriguing and deep without being complicated. It was an easy story to read and follow, highly entertaining with plenty of twists and turns to keep you hooked. Absolutely loved this story and I am so looking forward to reading the next installment. I would recommend this book to anyone – it has a bit of everything! Deviant Agendas: A Victoria Rodessa Legal Thriller - The V-Files Book 1 by Katherine Smith Dedrick is a complete stunner. The story follows Victoria Rodessa, a newly graduated law student who lands a job at one of the best companies in the country. Acker, Smith & McGowen is known for providing female lawyers ample opportunities to grow their careers and work side by side with men. Victoria feels blessed and excited when she is given the assignment with the firm's partners; this assignment can make their future very bright and can become very lucrative for Victoria. However, things are not as shiny and pretty as they seem. The law firm is filled with misogynists, criminals and liars. She has no idea what to do and what she should not do. If she follows her heart, she could lose her dream job, and lose everything. And if she doesn’t, her conscience will not let her live with herself. Her silence could cost her, but so will speaking out. What should she? This is a phenomenal, perfectly written novel. The characterization was amazing. I loved Victoria. She was a strong, resilient woman who knew what she should do in the end. I loved her resolve and how she stood up for what she thought was right. Things were hard for her, but she never gave up. This could be a great read for girls who are starting high school and college. This will definitely give them confidence and a much needed boost. A wonderful book. LOVE this book. I so rarely get to read a book these days, but I couldn't put this one down once I started. It's an easy read and the plot lines and character development are so rich! I can't wait for book #2 of this series. I also love the foreshadowing of key points early on which is so subtle yet there. Well done Katherine Smith Dedrick--you made the somewhat convoluted and arcane area of insurance law seem exciting and put it into a great context of characters and real life situations. Glad most law firms are not like THIS one. "Deviant Agendas'' has thrills of all kinds. The tight story is big and bold with main characters as enthusiastic and intrepid as Nancy Drew all grown up and wearing Christian Louboutins. V's ambition, brains and overall fearlessness give her the promise of greatness in the business of law, but make her ripe for exploitation. But will she fall for it? Ha, not for long. The story unfolds well and offers great glimpses into the world of law school, law firm culture and legal work because of the author's obvious experience and expertise. The details have the veracity and verisimilitude to make even a roller coaster ride of a story seem likely. A great read for anyone who enjoys strong women, bold stories and fun narratives. Wonderful book. A real page-turner. Extremely exciting; could not put it down. Excellent, clear writing. buy it and read it! Well done! Put it on your agenda to read Deviant Agendas! A great legal thriller! Victoria is such a great, strong, female lead. Smart, beautiful, sassy and confident. I think every women has felt what she experiences in the work place, but our heroine comes through shining. This is a very cleverly-written book that keeps you turning pages. It is very fast paced and you are not sure until the very end how it all comes out. 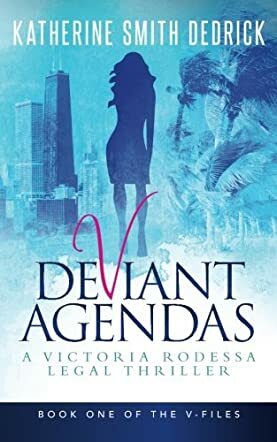 If you like legal thrillers, strong women, page turners, Chicago as a backdrop or an intelligent, realistic view of the working world, read Deviant Agendas! Such a fun read! Loved the characters and the story line! Can't wait to see what this author does next! Victoria was a great character and well developed. This book was a real page turner! I couldn't put it down. Victoria was a great character and well developed. There was a good mix of heroines and protagonists. I highly recommend it! I'm glad it is back in stock. Wow!! What an amazing read! I took this book to the beach and couldn't put it down. It kept me wanting to see what was around the next page. I will defiantly [sic] buy the next book by Katherine Dedrick ! Deviant Agendas grabs the reader and pulls them in through a fully developed cast of characters and the situations they find themselves in! This was a fun novel to read and I felt like I was a part of the story. The author does a great job of showing rather than telling as the story unfolds around Victoria and whatever comes her way! This is a wonderful first novel in this series and I look forward to the next book with great anticipation! I was fortunate to receive an advance copy of this book; it kept me entertained throughout. All of the characters are so well-developed. It was easy to picture each one and fun to root for a few of them! I loved observing how the central character, Victoria, responded to all that was thrown her way. I highly recommend this book! You want to Jump into the book! Victoria is marvelous - I'd like to be her. The characters are rich in texture and well developed. Quite frankly, I couldn't put it down. I thoroughly enjoyed the strong female characters. Ms. Dedrick's story telling grabs you from the start. You soon forget that you are even reading. Instead, you find yourself consumed within the chaos and excitement of the characters' lives. "'Deviant Agendas, a Winning Legal Thriller by Katherine Smith Dedrick' -- The Bottom Line: Driven by an exceptionally strong female lead, the first entry in Katherine Smith Dedrick's V-files series is a winner. Fledgling attorney Victoria Rodessa is destined for great things. Gutsy and glamorous, she has just graduated from one of the country's top law schools and been recruited into the ranks of Acker, Smith & McGowen. Landing a multi-million dollar client puts her on track to become the youngest and first female partner in the history of the company. But Victoria soon learns that Acker, Smith & McGowen isn't as rosy as she had hoped. Underneath the façade of benevolence and apparent dedication to female advancement in the legal field, the company breeds an undercurrent of misogyny and malice. When a potentially crippling issue arises with Victoria's top client, it's clear that the partners are willing to do just about anything to silence her. Faced with the prospect of a ruined career (or worse), Victoria must choose to flee or fight, knowing that the price of either choice is bound to be high.